If you are considering a lens implant for after cataract surgery you should become aware of premium lens implants and their advantages over traditional monofocal implants. If you have astigmatism the Toric IOL may be the best option to discuss with your cataract surgeon. Dr. Richard Leung pleased to offer Toric IOLs for Astigmatism correction after cataract surgery. The recent advancements in Intraocular Lens (IOL) technology have now made it possible to provide an effective solution for patients that have astigmatism. Until recently, patients that were IOL candidates and had astigmatism, had no option built into the lens, which would correct the astigmatism aspect of their visual condition. Surgeons would typically perform refractive surgery or LASIK after the insertion of an IOL to correct the complete visual picture. If patients did not have astigmatism correction after IOL implantation then contacts or glasses would be required to deal with the astigmatism. With advancements in the optics of IOLs the manufacturers have now been able to accommodate for astigmatism. Toric IOL technology uses biocompatible materials that have been successfully used in contact lenses and proven safe for the eye. There is an additional cost for this lens implant. What happens during the TORIC IOL surgery process? The AcrySof® Toric IOL is surgically inserted into the eye during an outpatient procedure. This process is the same process for cataract surgery and is similar to the placement of many other IOLs. You can get a complete description of the cataract surgery process on this page of our ophthalmology website but we will also provide a short description on this page for your review. First, the eyes are numbed with medicated eye drops, and the patient is given a mild sedative so that he or she will feel no discomfort during treatment. * The AcrySof® Toric IOL lens is specially designed to correct astigmatism by changing how light is reflected as it passes through the eye. Using this treatment, patients with astigmatism not only experience relief from cataracts, but are also able to see clearly after treatment without the need for additional vision correction. In January 2007, Medicare approved a new monofocal IOL called the Acrysof Toric IOL for patients with cataracts and astigmatism. The AcrySof Toric corrects for both conditions, cataracts and astigmatism. The Acrysof Toric IOL is a foldable, single piece lens that is implanted during cataract surgery to replace the clouded lens. 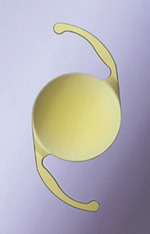 The unique design of the AcrySof Toric IOL makes it possible to reduce or eliminate corneal astigmatism and significantly improve uncorrected distance vision. AcrySof Toric lens provides excellent distance vision, independent of eyeglasses and contact lenses. If you are seeking Astigmatism correction San Diego please feel free to contact us to schedule an eye exam. Which Premium Lens Implant is Right for me? If you are like many San Diego eye surgery patients seeking lens implants you are probably wondering which implant is right for me? During your consultation, the doctors and staff at San Diego Eye & Laser Center will discuss with you the various premium implant options and which one is the best solution for you based on your lifestyle and your specific visual needs. Each of the premium lens implants options have unique attributes that may or may not be beneficial for you.